Work by Penkhull Artist Potters Association founder Mike Cain has just gone on show at Mellards on Market Lane in Newcastle under Lyme. The work includes paintings, prints and mixed media work, partly inspired by Stoke's industrial past. For full details please check out our 'NEWS' page. Part of the gallery space at the Spode Museum and Heritage Centre. 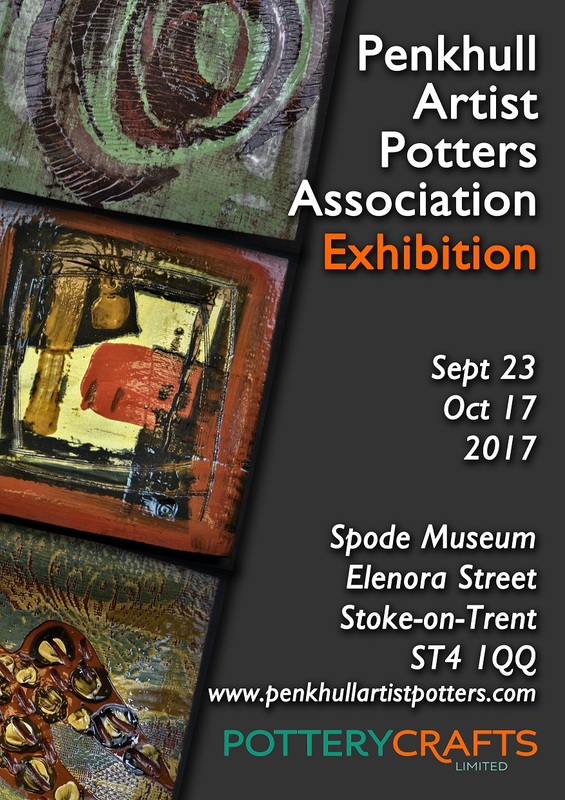 The Penkhull Artist Potters Association held its first exhibition at the Spode Museum and Heritage Centre in Stoke-on-Trent from Saturday September 23rd until Tuesday October 17th 2017. It was also the official launch of the group and its micro-pottery. The group's members showed around seventy pieces of ceramic art, plus a number of paintings, prints and mixed media pieces. "Three weeks have passed like a blink of an eye but its been a rewarding experience. I've especially enjoyed meeting and talking with some of the hundreds of visitors who came to see our work." Mike Cain. The Penkhull Artist Potters exhibition was actually a double first. Not only was it the group's first show, but they were the first artists to showcase their work in the new gallery space at the Spode Museum. The trust has ambitious long term plans to create what it calls a 'creative hub' inside its centre on the 'Spode Works' site. While committed to preserving its heritage - through its ceramics collection and its live demonstrations - the museum also wants to encourage new and existing creative talent through its new gallery which has been set-up in association with the One-One-Six gallery run by Darren Washington. "We'd like to thank Darren, the museum, its trustees, staff and volunteers for all their help and support in staging our first exhibition. We couldn't have wished for a better start." said Mike Cain. "We are extremely pleased to have welcomed the Penkhull Artist Potters to the museum, and we hope this is the beginning of a long term relationship between them and the museum." While Stoke-on-Trent has remained at the heart of Britain's pottery industry, many long established companies have closed, merged or moved production overseas. However the city has played host to the very successful television series 'The Great Pottery Throw Down' which has renewed interest in hand made ceramics. Its against this backdrop that the Penkhull Artist Potters Association has launched its new micro-pottery in September 2017. "Although we've worked as artists in our own right for decades, we only started making ceramic art together very recently. I think by sharing experience and technical knowledge we've all developed much quicker than working alone." said Tony Wild. L to R: Dave Harper, Tony Wild & Mike Cain - photo from the Sentinel newspaper. The launch of the Penkhull Artist Potters Association and its first exhibition received significant local media coverage including an article in the Penkhull Recorder, a feature story in the Stoke Sentinel newspaper, a live broadcast from the group's ceramics studio on BBC Radio Stoke's breakfast show, and a full page feature in Staffordshire Life magazine.